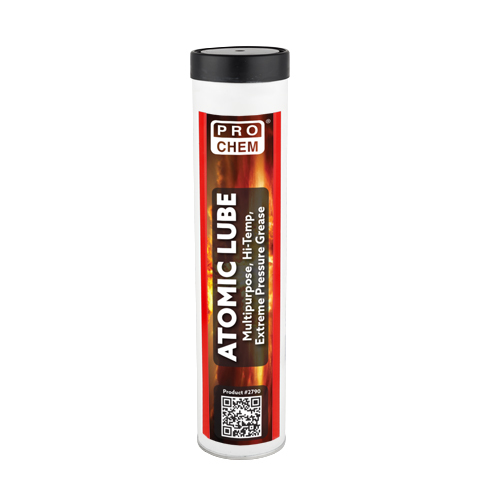 ATOMIC LUBE | Pro Chem, Inc.
ATOMIC LUBE is a unique blend of petroleum oil and special synthetic polymers that combine to form an extremely water-resistant, tough lubricating film. It prevents water washout and metal-to-metal contact, even under extreme pressure or shock loading. It is a non-melting, premium quality grease specifically designed for very heavy-duty service in multiple adverse environments. Its unique formulation provides the optimum amount of additives to provide protection from rust, corrosion and oxidation. It can be used in a wide variety of applications, reducing the number of lubricants you need to have on hand. Pump in ATOMIC LUBE until all old grease comes out.